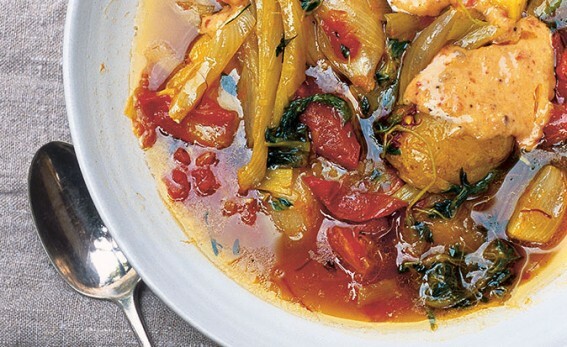 This is like a Provençal fish soup without the fish. It has a really gutsy flavour. If you want to make it fishy, you can poach some fish in the soup at the end; or you can cook fish separately and put some on top of each serving. If you don’t like rouille you can serve this stew with aioli instead. Heat the oil and gently sauté the potatoes, onions and leeks for about 15 minutes. It’s nice if the potatoes get a little golden. Stir from time to time to make sure nothing is sticking. Add the garlic and chilli and sauté for another minute, then add half the stock. Bring to the boil, add the saffron, orange zest, 2 of the thyme sprigs, salt and pepper and reduce to a simmer. Cook until the potatoes are just becoming tender, about 10 minutes. Add the fennel and the tomatoes. Stir well and cook until the vegetables are tender, another 10 minutes or so. Stir carefully every so often to make sure everything’s well coated in the saffron juices, but try not to break up the potatoes. For the rouille, put the garlic and a little salt into a mortar and grind to a purée. (Or crush the garlic and put into a bowl with some seasoning.) Mix in the yolks, then add the oil drop by drop, beating all the time (with a wooden spoon or electric hand beater). The mixture should thicken. Don’t add the next drop of oil until the previous drop has been incorporated fully and the mixture has thickened. Add the tomato purée, lemon juice to taste and the cayenne, then adjust the seasoning. Strip the leaves from the remaining thyme sprig and add to the stew. Serve in soup plates with rouille spooned on top. I sometimes also serve grated Gruyère and croûtes, as you would with Provençal fish soup.